In conjunction with the 2019 International Hoof-Care Summit being held in Cincinnati from Jan. 22-25, International Hoof Care Week begins on Jan. 22. Perhaps more than most wildlife facilities, hooves are a big deal at Fossil Rim. With 26 hooved species plus two rhino species, hooves can be found on nearly half of the animal species featured on property. Aoudad require more hoof care than other hoofstock species at Fossil Rim. 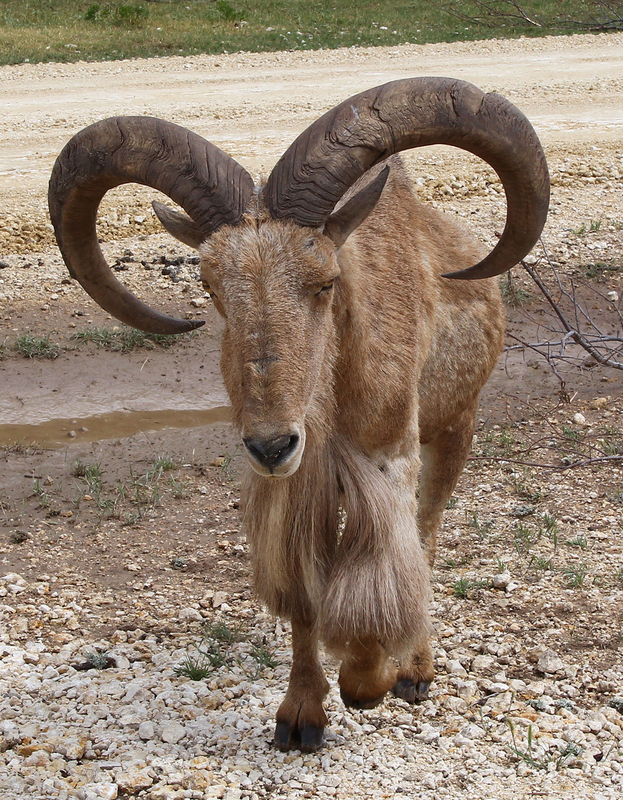 On a higher-protein nutritional plan than they would receive in the wild and far outliving their life expectancy in the wild, older aoudad are less likely to wear down their hooves naturally and thus require hoof trims. 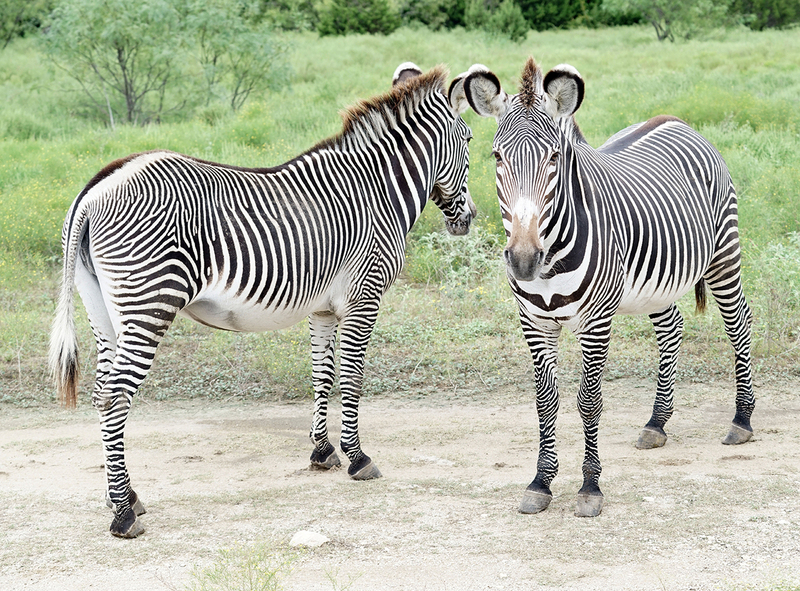 If the hooved animals – called “hoofstock” at Fossil Rim – do not keep their hooves worn down, they can actually grow too long and even impede the animal’s ability to walk. Executive Director Kelley Snodgrass finds addax hooves interesting because of how wide they are. It is easy for visitors to get a close look at addax hooves because of their inclination to approach vehicles for pellet feed. Snodgrass pointed out a particular species that requires more hoof care than others at Fossil Rim. As guests travel through the park, Snodgrass suggests taking a look at the hooves of an addax. Located in the Main Pasture, addax have a reputation for approaching vehicles in search of pellet feed, so getting a close look at them is very feasible. 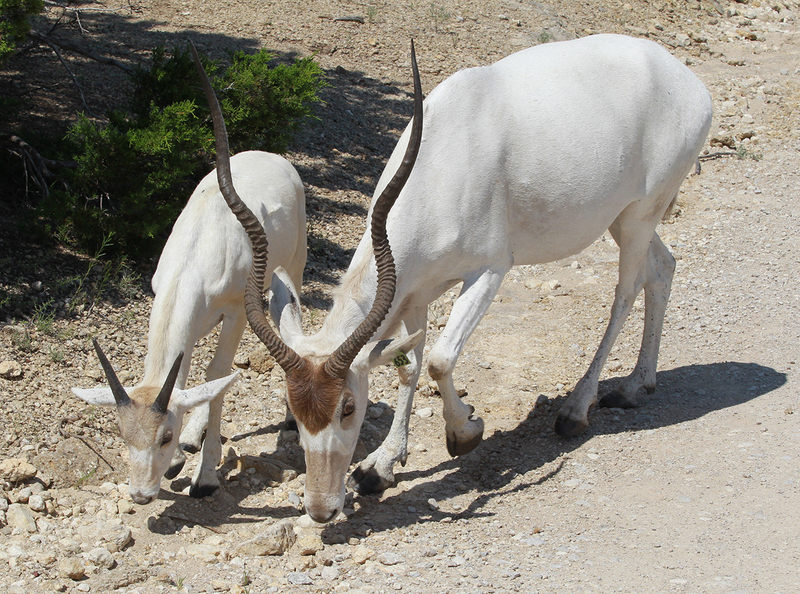 “Addax hooves are particularly interesting to me because they are so wide, which suits them well on the sand in their native range,” Snodgrass said. International Hoof Care Week is essentially a time to give the tip of the cap to the work done by farriers. A farrier is defined as “a craftsman who trims and shoes horses’ hooves”. International Hoof Care Week is a time to honor farriers. 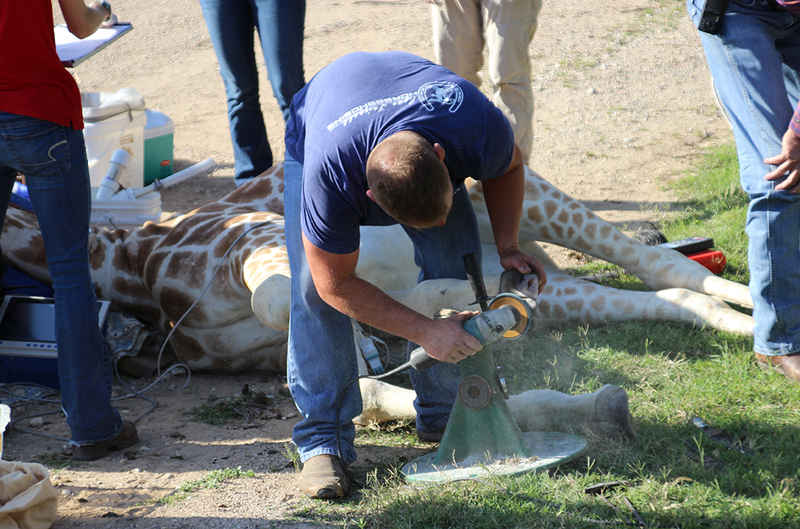 Ryan Frizzel has been very helpful to Fossil Rim, including the instances he has worked on the hooves of the giraffe “Nyla”. “They are specialists and experts in their field,” Snodgrass said. “Hooves are the foundation of the animal for it to walk correctly as it travels throughout daily life. A zebra, for example, has a very complex foot, so we will call a specialist when we require something beyond a basic hoof trim. Farriers who assist Fossil Rim often reside in nearby towns like Weatherford and Stephenville. Dr. Les Waymack once saved an endangered Grevy’s zebra at Fossil Rim through repetitive shoeing and corrective trimming of its hooves. 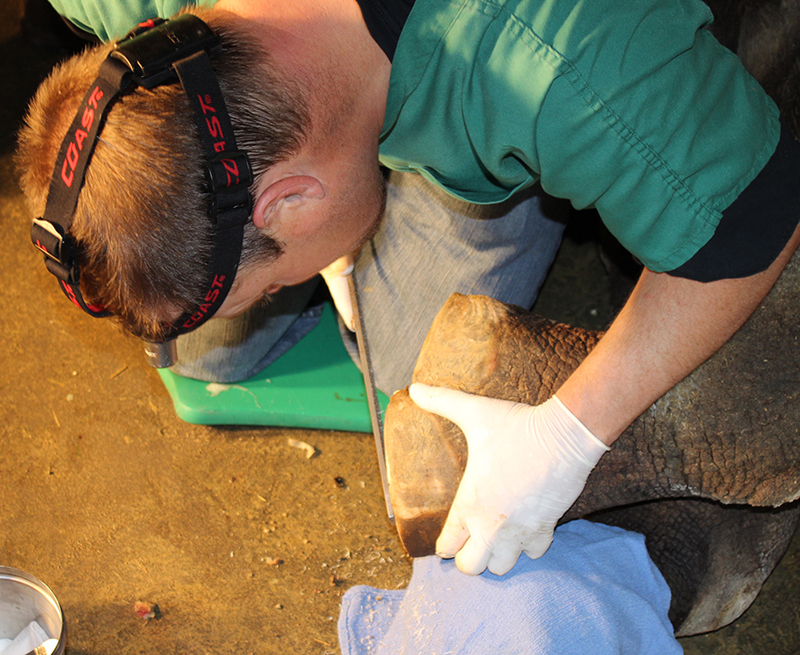 Though not a farrier, Dr. Dustin Dorris, an equine veterinarian from Stephenville, was usually the primary person to debride and clean the feet of the black rhino “Coco”. While rhinos have toes, as opposed to hooves, they sometimes require hoof care. For a while, “Coco” the black rhino regularly had her feet worked on to help her overcome lameness and inflammation. Though not a farrier, Dr. Dustin Dorris, an equine veterinarian from Stephenville, was usually the primary person to debride and clean the rhino’s feet. Lisa Stephens, an equine veterinarian from Weatherford, also regularly assisted with Coco among many other animals. Staff members from animal care like Adam Eyres, and staff from animal health like Dr. Holly Haefele, perform basic hoof care at times. 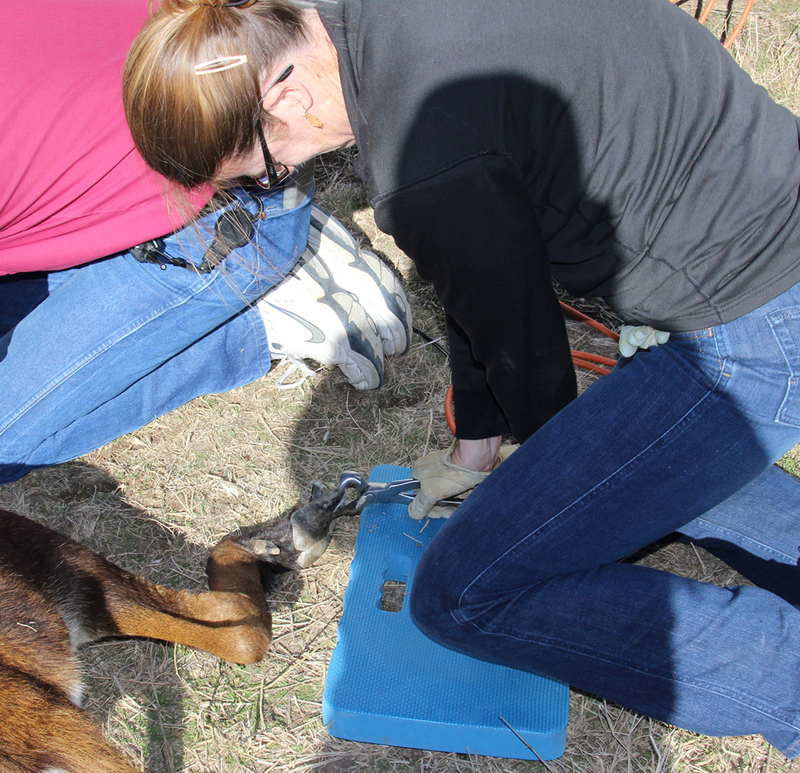 Here, they are doing hoof trims on sable antelope. 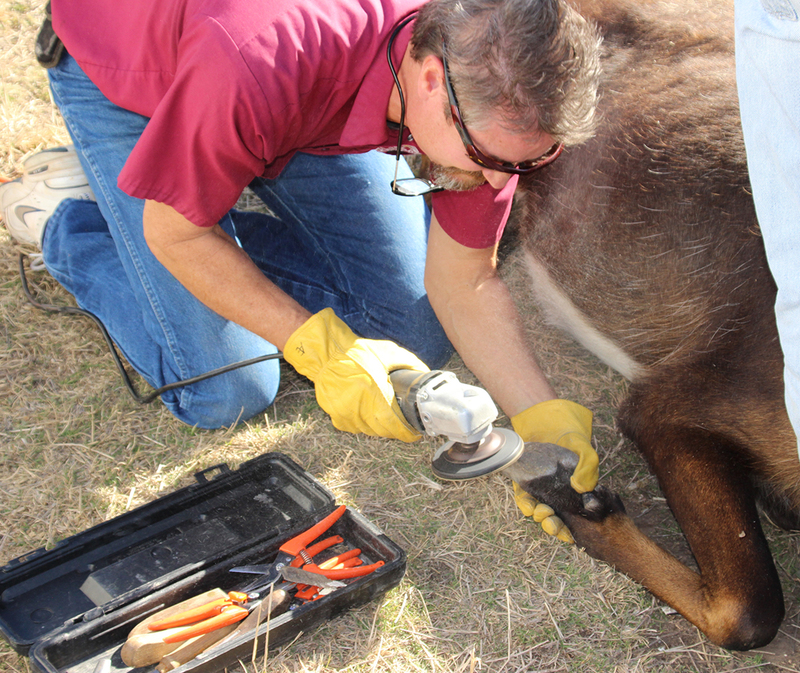 Although he stressed not to compare their work to that of farriers, Snodgrass said that Fossil Rim staff members from animal health (Dr. Holly Haefele, Dr. Julie Swenson) and animal care (Adam Eyres, Justin Smith, Molly Shea) perform basic hoof care – primarily hoof trimming. While farriers may be trained to work on horses and cattle, Snodgrass said their skills are very applicable to the exotic species at Fossil Rim, which make their assistance such a valuable asset. “Being a farrier is hard work,” he said. “Usually, when a farrier helps us, it is with an animal that is laying down, which can be an awkward position compared to what they are used to. We are very thankful for the farriers, veterinarians and other highly trained specialists who help us out. These people are experts in their (respective) fields.